Teenage Sam and his little sister Lizzie are starving on the streets of London, which is gripped by terrible cold. Asking an old businessman for money, by a man who looks at them with such sheer contempt that Sam's heart fills with hate. He swears that he will seek vengeance and rob the old man, not caring whether his victim will live or die. But before he can do so, a strange spirit appears to him, and warns him about the terrible path he will put himself on with this violent act. Can Sam resist the temptation to gain revenge? Several more spirits show him the possible consequences of his action, as we see Dickens's classic A Christmas Carol from a new viewpoint. I love A Christmas Carol so picked this up with a mixture of excitement and apprehension (not helped by me somehow having never read a Chris Priestley book before.) I wanted it to be really good, but was worried it would feel like a pale imitation of the Dickens classic. Nothing could be further from the truth! Shifting the point of view to follow two orphans who are the subjects of Scrooge's disdain, we see familiar events through a different lens. It's a fascinating treatment of an enduring classic which works because Priestley captures the existing characters so well and introduces a pair of brilliant new ones in Sam and Lizzie. It's a short, quick read - it took me perhaps three quarters of an hour - but there's some nice bonus content in the shape of a Chris Priestley piece on A Christmas Carol, and another on adaptations of it, as well as a preview of Priestley's The Dead Of Night. Despite its brevity, Priestley brings his characters to life superbly and made me care a lot about them in a short space of time. It's also one that I think would be well worth rereading - I can see this ending up as a companion to the Dickens original on shelves, as something you can go back to every Christmas! Sophie-Claire Wright went to be a singer-songwriter in Nashville - but fame never happened for her. When she gets kicked out of her apartment by her roommate, she gives up on her dream to return to her small Southern town. Being back in her old home isn't too bad, but her mother is desperate to set her up with a new beau. 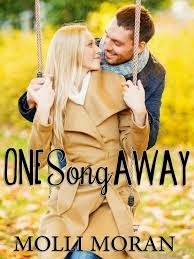 Sophie invents one to put her off, then when her mother asks to meet him, has to ask former best friend (and secret crush) Jake Cooper to pretend to be her fill-in boyfriend. It's a simple arrangement in return for a favour - but then Sophie's crush on Jake returns. Does he feel the same way about her? And is her Nashville dream completely over? I love the idea of NA - capturing the time when someone is starting to settle into a new period of their life - and have found perhaps three or four books which really deliver on that promise, up to now. Easy, Brooklyn Girls and The Gravity Between Us all do a great job of it, as does this new novel from Molli Moran. Sophie-Claire and Jake are a pair of brilliant characters and I love the chemistry between them which is clear from the first moment they interact. Despite this sizzling chemistry, it's not as explicit as a lot of the NA books I've read, and is all the better for it. The way that Molli Moran has captured small-town life is absolutely fantastic here; I grew up in a village on the outskirts of a fairly small town and it feels incredibly real to me. There are some great supporting characters - my favourite being Sloane Delgado; I was extremely excited when Molli mentioned in an interview with me a few weeks ago that she'll be working on a companion novel from Sloane's point of view next year! Fans of sweet romances and New Adult books should make sure they read this. It's a massive bargain, as well, at under £2 on Kindle! 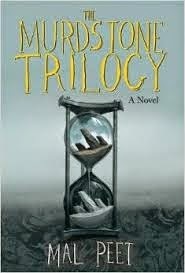 The Murdstone Trilogy by Mal Peet (David Fickling Books, bought) - Note; this is adult not YA. Well, it's never quite that easy, is it? The simple bargain always has a drawback... but I'll leave you to find out for yourself just how things go wrong for Murdstone. This reads as if PG Wodehouse and Stella Gibbons had been reincarnated, seen the legacy that Tolkien had left behind, and got roaring drunk and combined to write a book in response to this. It is screamingly funny in a lot of places - although, as pointed out to Mal Peet in the Foyles event last week, hardly seems calculated to make him many friends. Pot shots are taken at fantasy fans and authors, Amazon, awards ceremonies, countryside dwellers... it can be vicious (although less so than I'd expected in places), but it's always massively entertaining. The strange thing is, given Mal's views on fantasy seem rather similar to Philip Murdstone's, you wouldn't expect him to be able to write a compelling fantasy novel - but he absolutely has. (Or, at least, parts of one.) The extracts we see from the Murdstone Trilogy are completely enthralling, despite there being no Pocket to write them for Mal. (I hope, at least!) Speaking of Pocket, he is the standout character here, and the relationship between him and Murdstone - both desperately needing the other to succeed, and wishing they didn't - is brilliantly portrayed, as Pocket gets more and more frustrated and Murdstone starts to enjoy the high life. My only slight issue with this was that I'd have preferred a different ending; but that's a personal thought and I think the one Peet will probably work well for the majority of readers. Overall, this is an incredibly strong book and I think whether or not you're a fantasy fan, you should definitely check it out! There's a brilliant review over at the Bookbag from Jill Murphy who's even more of a fan than I am, saying "The Murdstone Trilogy is my favourite book of the year so far."